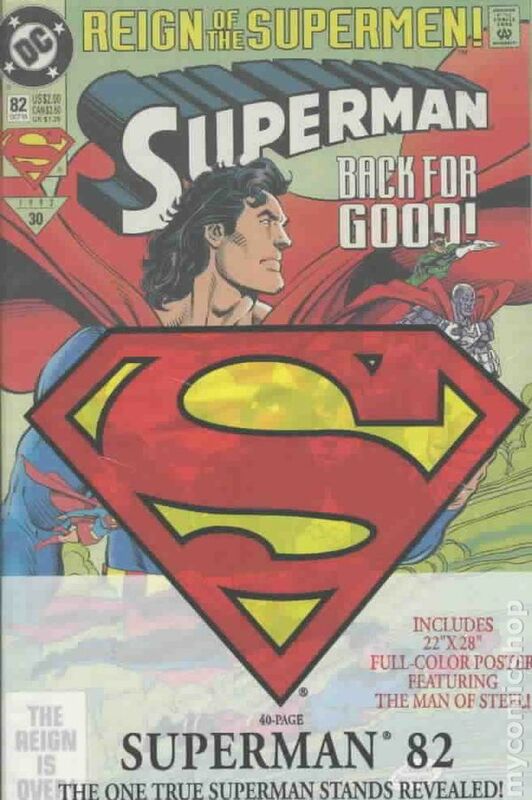 The Return of Superman Limited Collector's Set - Factory Sealed. All comics are 1st printings. Back from the Dead? 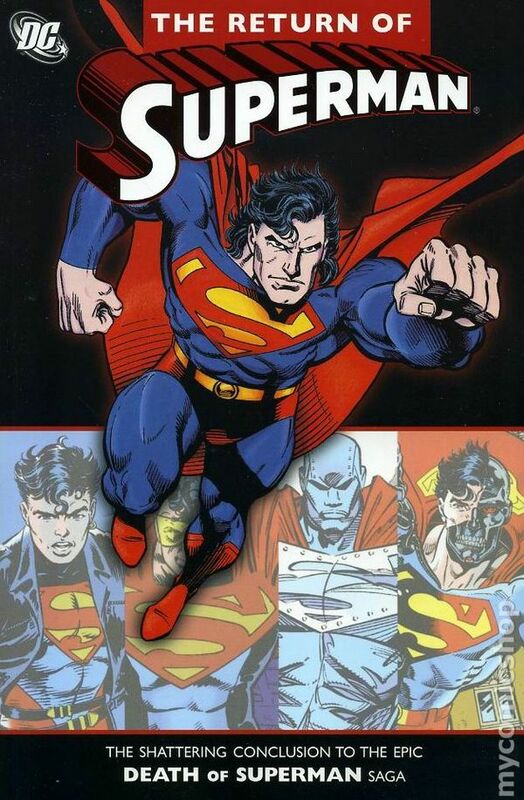 Following the Death of Superman, four new Supermen are introduced in the storyline "The Reign of The Supermen". Which, if any, is the real Superman? 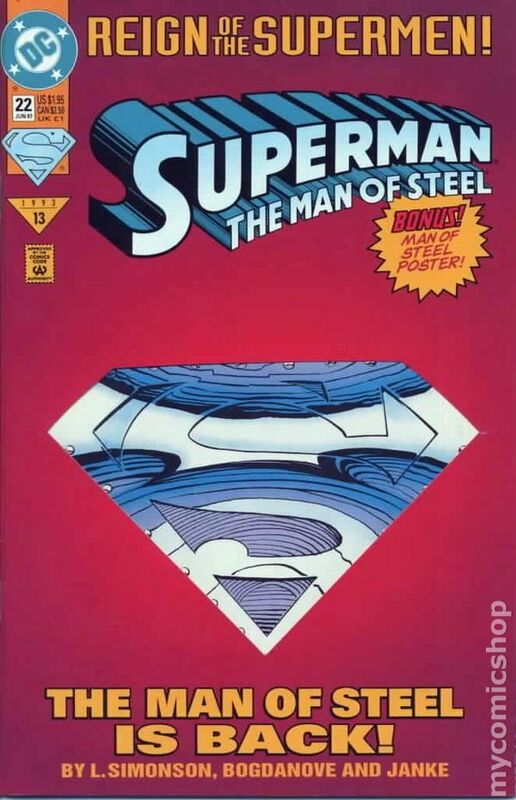 SET 1 includes 5 comics: Adventures of Superman #500, Superman #78, Action Comics #688, Superman the Man of Steel #22, & Adventures of Superman #501, PLUS a full color 20" x 27" wall poster, one sheet of Superman SkyCaps, and 4 Bloodlines trading cards. GRADING NOTE: Comics considered new in package "as originally packaged" inside the sealed wrap. Any defects inherently caused to the comics from the packaging itself, whether visible or not, will not counted against the grade. However, any soiling, tearing, or other obvious wear to the wrapping itself will be considered in the final grade determination. Published May 2016 by DC. Volume 3 - 1st printing. 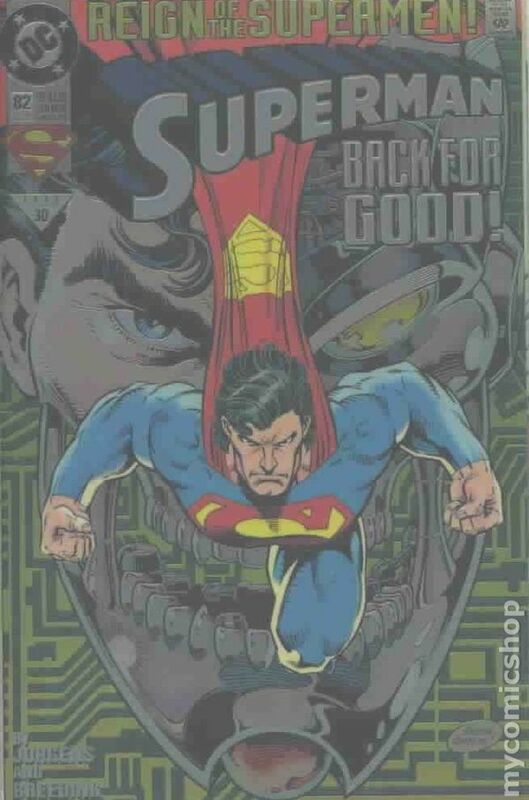 Collects Action Comics (1938-2011 DC) #687-688, Adventures of Superman (1987-2006) #500-502, Superman (1987-2011 2nd Series) #78-79, Superman (1987-2011 2nd Series) Annual #5, Superman: The Man of Steel (1991-2003) #22-23 and Superman: The Man of Steel (1991-2003) Annual #2. Written by Dan Jurgens, Roger Stern, Jerry Ordway, Karl Kesel, and Louise Simonson. Art by Jon Bogdanove, Jackson Guice, Tom Grummett, Dan Jurgens, Dave Lapham, and Eddy Newell. Cover by Dan Jurgens and Brett Breeding. Superman is dead. And now, four mysterious beings appear-all with powers and abilities like the Man of Steel's! One claims he is a clone of Superman. 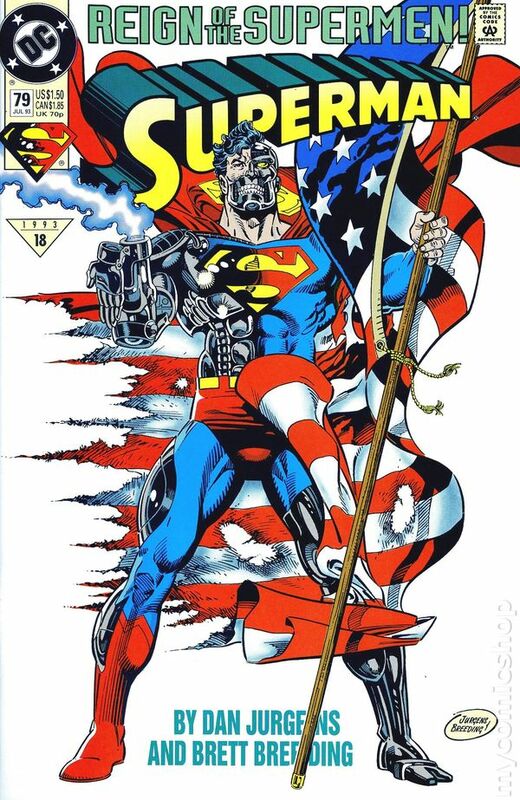 Another says he is a Cyborg Superman. The third is a cold redeemer of justice. And finally, an armored figure says he fights with the heart and soul of Superman. Softcover, 338 pages, full color. NOTE: This volume looks fantastic on the bookshelf with the others 4 volumes in the series (Superman The Death of Superman TPB (2016 DC) New Edition, Superman Funeral For a Friend TPB (2016 DC), Superman The Return of Superman TPB (2016 DC) New Edition, and Superman Doomsday TPB (2016 DC) New Edition). When side-by-side, their spines unite to create the unforgettable Death of Superman Symbol. Cover price $24.99. 2nd Edition - Volume 4 - 1st printing. Collects Action Comics (1938-2011 DC) #689-692, Action Comics (1938-2011 DC) Annual #5, Adventures of Superman (1939-2006) #503-505, dventures of Superman (1939-2006) Annual #5, Green Lantern (1990-2004 2nd Series) #46, Superman (1987-2011 2nd Series) #80-83, and Superman The Man of Steel (1991-2003) #24-26. Written by Gerold Jones, Dan Jurgens, Karl Kesel, Louise Simonson, Roger Stern. 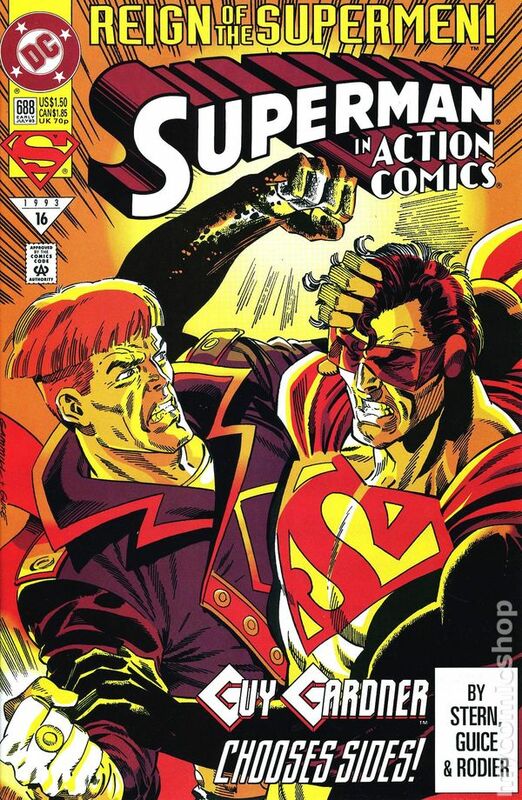 Art by Dan Jurgens, Jon Bogdanove, Tom Grummett, Jackson Guice, Brett Breeding, Doug Hazelwood, M.D. Bright, and Romeo Tanghal. 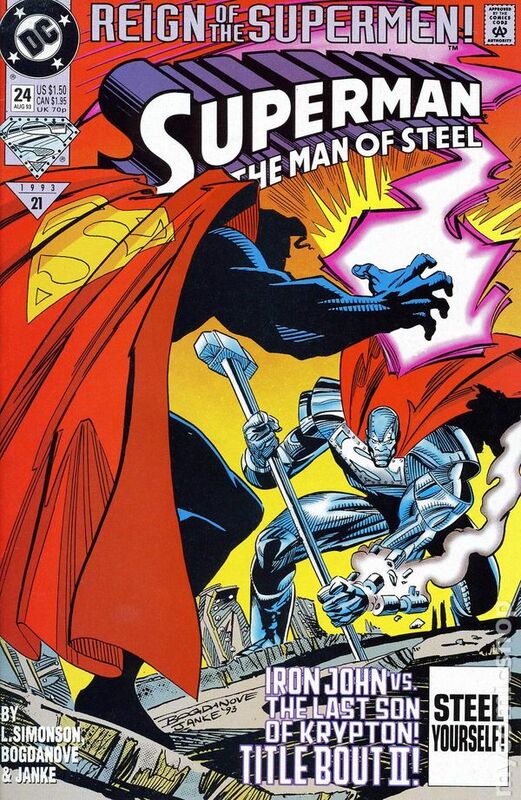 Cover by Dan Jurgens and Brett Breeding. As an alien warship approaches Earth, the world still doesn't know which-if any-of the four replacement Supermen is the real Man of Steel. Each has a claim to the title, but two show their true colors when they battle the others for supremacy. Meanwhile, the true Superman-restored by a Kryptonian regeneration matrix-is plotting his return! Softcover, 480 pages, full color. 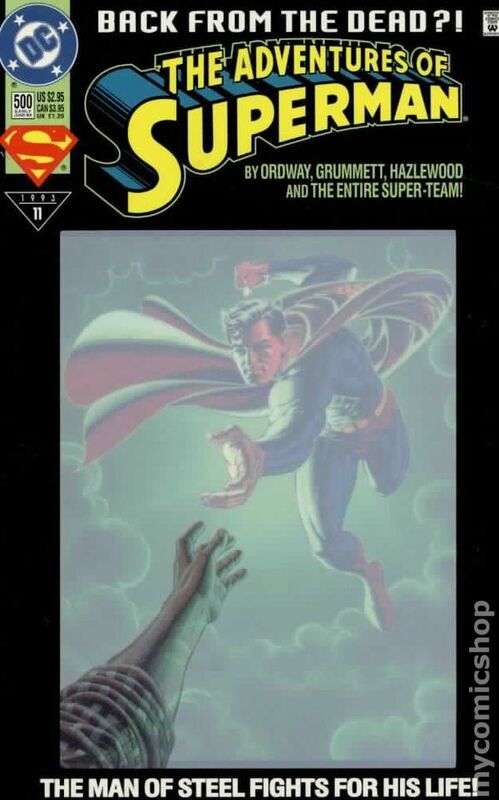 NOTE: This volume looks fantastic on the bookshelf with the others 4 volumes in the series (Superman The Death of Superman TPB (2016 DC) New Edition, Superman Funeral For a Friend TPB (2016 DC), Superman Reign of the Supermen TPB (2016 DC) and Superman Doomsday TPB (2016 DC) New Edition). When side-by-side, their spines unite to create the unforgettable Death of Superman Symbol. Cover price $29.99. Published Oct 1993 by DC. 2nd printing Cover price $1.25. Published Jun 1993 by DC. Jerry Ordway script; polybagged Collector's Set in white bag; 8 extra story pages; Removable translucent cover; "Bloodlines" trading card. Cover price $2.95. Jerry Ordway script. This copy is not in original white polybag and does not include trading card. NOTE: Copies where the translucent sticker featuring Pa Kent's arm reaching out towards Superman have been removed will be graded in GD condition. Cover price $2.95. Signed by inker Doug Hazelwood with Lone Star Comics certificate of authenticity. Jonathan Kent refuses to let his son pass from this mortal coil without a spiritual fight in "Life After Death!" Written by Jerry Ordway. Art by Tom Grummett & Doug Hazlewood. Also - 4 page sequences by: Louise Simonson, Jon Bogdanove & Dennis Janke; Roger Stern, Jackson Guice & Denis Rodier; Karl Kesel, Tom Grummett & Doug Hazlewood; Dan Jurgens & Brett Breeding. Cover by Grummett & Hazlewood. Cover price $2.50. Die-cut cover by Jackson Guice; 687N cover by Kerry Gammill and Jackson Guice. Beginning the 'Reign of the Supermen,' continued from Adventures of Superman (1939) #500. The Last Son of Krypton returns to action, and this Superman has no qualms about taking a human life...so long as it's the right thing to do! Also, Pa Kent reacts to Superman's tougher techniques. 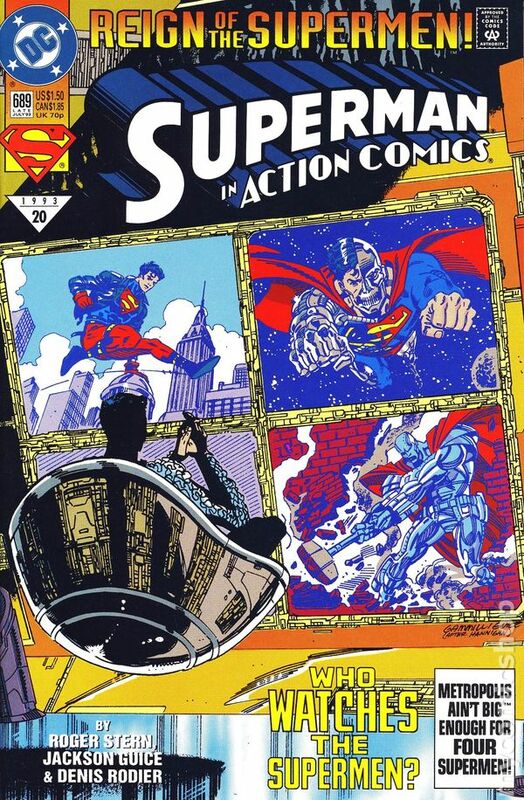 Bound into the center of this issue is a double-page miniposter of Superman, printed on cover stock. Written by Roger Stern, with art by Jackson Guice and Denis Rodier. Cover price $1.95. Cover by Kerry Gammill and Jackson Guice. Beginning the 'Reign of the Supermen,' continued from Adventures of Superman (1939) #500. The Last Son of Krypton returns to action, and this Superman has no qualms about taking a human life...so long as it's the right thing to do! Also, Pa Kent reacts to Superman's tougher techniques. 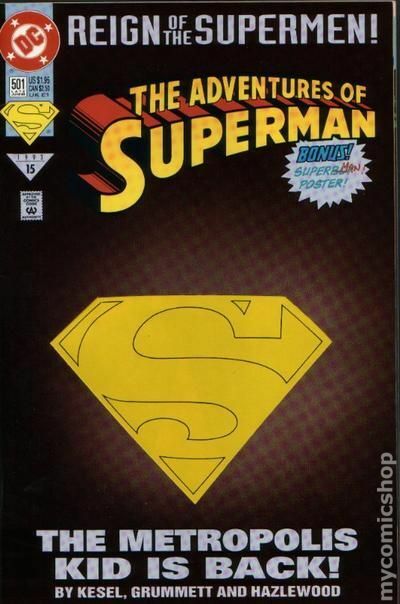 Bound into the center of this issue is a double-page miniposter of Superman, printed on cover stock. Written by Roger Stern, with art by Jackson Guice and Denis Rodier. Cover price $1.50. #22D special double cover of the Collector's Edition by Jon Bogdanove and Dennis Janke features a unique die-cut design on the outer cover. Beginning the 'Reign of the Supermen,' continued from Adventures of Superman (1939) #500. The Man of Steel returns to Metropolis to quell the latest crime wave in Suicide Slum led by a new, ruthless female crime lord, and Jeb is back in town to see Lois Lane in the wake of Clark Kent's disappearance. 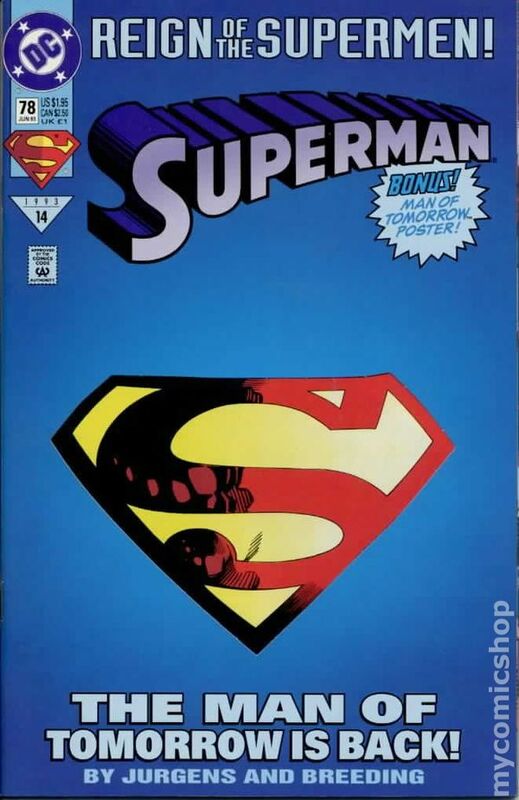 Bound into the center of this issue is a double-page miniposter of Superman, printed on cover stock. Written by Louise Simonson, with art by Jon Bogdanove and Dennis Janke. Cover price $1.95. #22N cover by Jon Bogdanove and Dennis Janke. Beginning the 'Reign of the Supermen,' continued from Adventures of Superman (1939) #500. The Man of Steel returns to Metropolis to quell the latest crime wave in Suicide Slum led by a new, ruthless female crime lord, and Jeb is back in town to see Lois Lane in the wake of Clark Kent's disappearance. 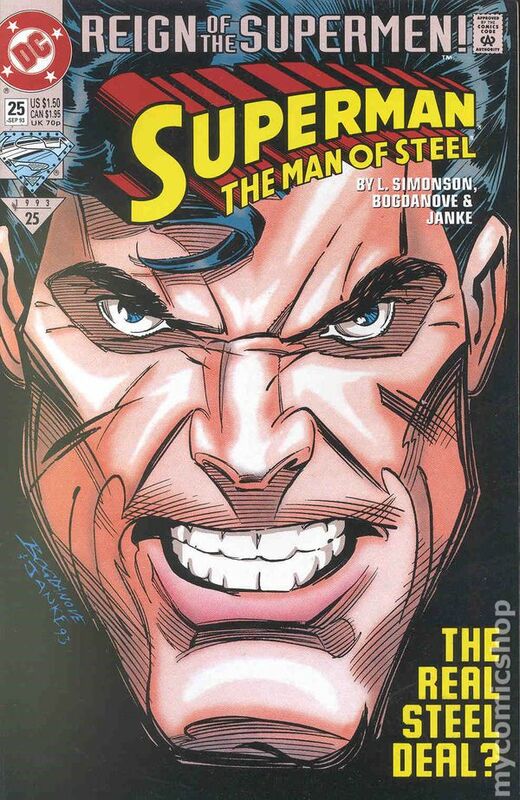 Bound into the center of this issue is a double-page miniposter of Superman, printed on cover stock. Written by Louise Simonson, with art by Jon Bogdanove and Dennis Janke. Cover price $1.50. Collector's edition - Die-cut cover. Reign of the Supermen! "Alive!" Guest-starring the Guardian. Story by Dan Jurgens. Art by Dan Jurgens and Brett Breeding. Can it be true...has the Man of Steel returned from the grave? Someone, or something, has arrived with the look and power of the fallen hero, and he's here for Doomsday. Woe to any that would stand in his way. Includes a poster titled "The Man of Tomorrow!" 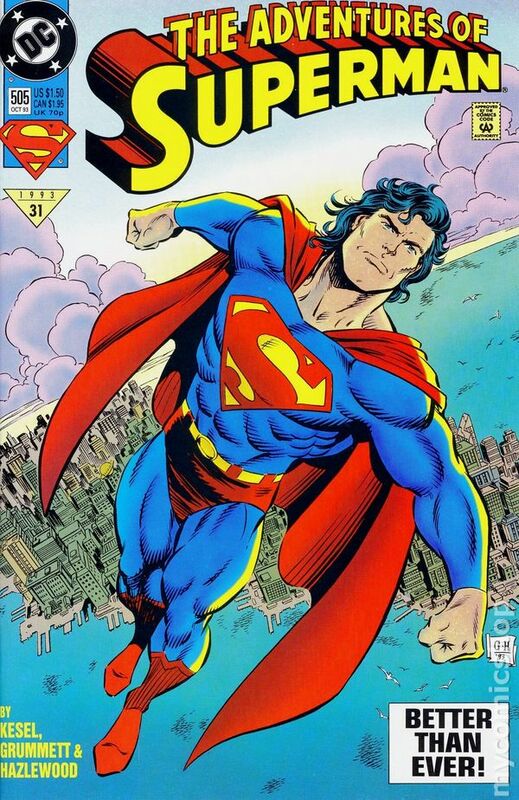 NOTE: Check out Action Comics #687, Adventures of Superman (1939-2006) #500, and Superman: The Man of Steel #22 to follow the adventures of the other Supermen. Cover price $1.95. 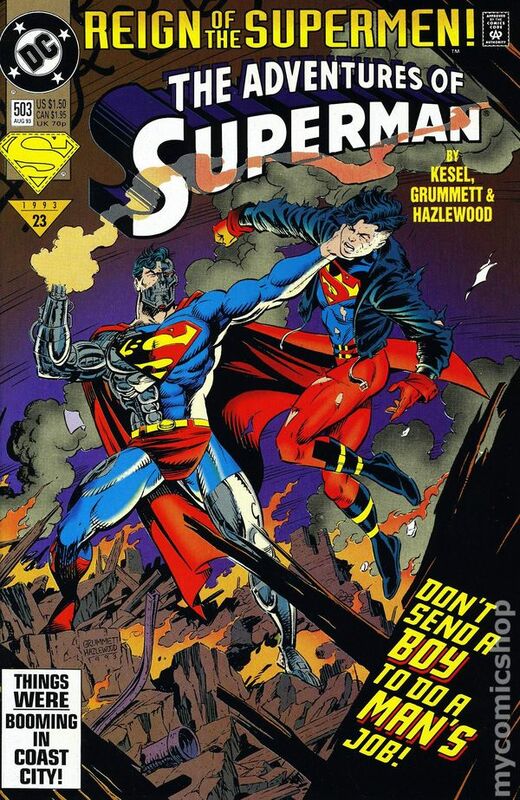 Newsstand Edition - Reign of the Supermen! "Alive!" Guest-starring the Guardian. Story by Dan Jurgens. Art by Dan Jurgens and Brett Breeding. Can it be true...has the Man of Steel returned from the grave? Someone, or something, has arrived with the look and power of the fallen hero, and he's here for Doomsday. Woe to any that would stand in his way. Includes a poster titled "The Man of Tomorrow!" 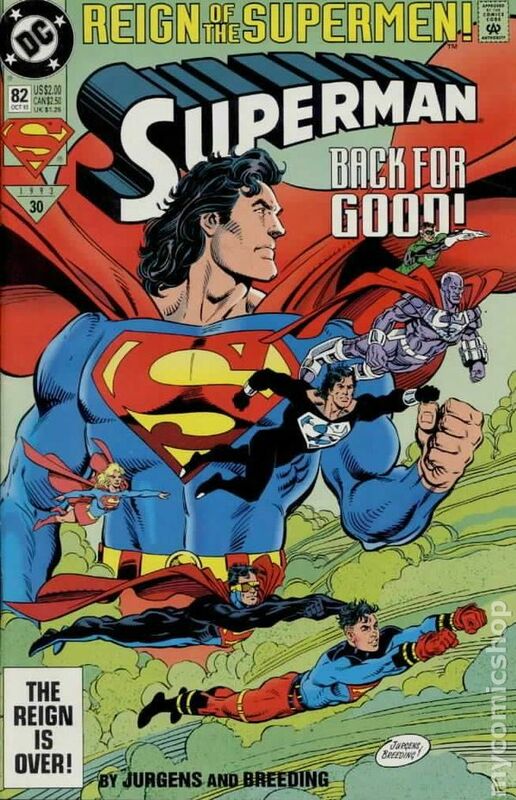 NOTE: Check out Action Comics #687, Adventures of Superman (1939-2006) #500, and Superman: The Man of Steel #22 to follow the adventures of the other Supermen. Cover price $1.50. Collector's Edition with Die-Cut Cover. Reign of the Supermen! There's a youngster in town claiming to be Superman in "The Adventures of Superman...When He Was a Boy!" Guardian cameo. Written by Karl Kesel. Art & cover by Tom Grummett & Doug Hazlewood. Centerfold poster by Grummett & Hazlewood. Cover price $1.95. Regular Edition. Reign of the Supermen! There's a youngster in town claiming to be Superman in "The Adventures of Superman...When He Was a Boy!" Guardian cameo. Written by Karl Kesel. Art & cover by Tom Grummett & Doug Hazlewood. Centerfold poster by Grummett & Hazlewood. Cover price $1.50. Published Jul 1993 by DC. Signed by cover artist Kerry Gammill with Lone Star Comics certificate of authenticity. Reign of The Supermen! "An Eye for an Eye" by Roger Stern (script) & Jackson Guice/Denis Rodier (art); Kerry Gammill cover; Guy Gardner, Eradicator (as Superman), Lois Lane, Cat Grant app; Cameos by Blue Beetle, Superman, Ice, Doomsday, Superboy; Cover price $1.50. 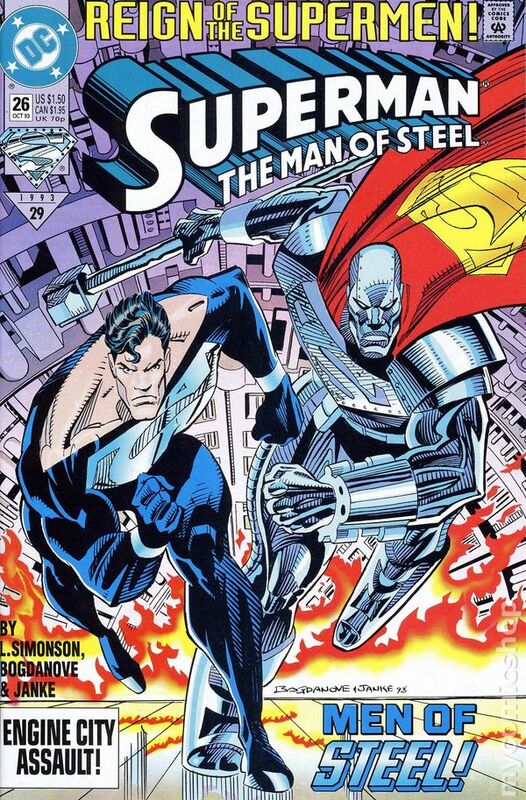 'Reign of the Supermen' continues: It's Iron John vs. the Metropolis Kid as the Man of Steel crosses paths with the youthful Superman, and members of the media begin picking their favorite Superman. Also, Lex Luthor II squares off against the White Rabbit. All the Superman titles now use a new, upgraded color process that employs an increased color palette. Written by Louise Simonson, with art and cover by Jon Bogdanove and Dennis Janke. Cover price $1.50. Reign of the Supermen! "Prove It!" Story by Dan Jurgens. Art by Dan Jurgens and Brett Breeding. Four men of power have arrived, seemingly out of nowhere, and all claim to be the Man of Steel incarnate. Daily Planet reporter Ronald Troupe writes an expose exploring the facts and mystery behind the return of Superman, or Supermen, as the case maybe. Cover price $1.50. 'Reign of the Supermen' continues: When Supergirl is sent by Luthor to bring in the youngest Superman, sparks fly between the two heroes. All the Superman titles now use a new, upgraded color process that employs an increased color palette. Written by Karl Kesel, with art by Tom Grummett and Doug Hazlewood. Cover by Grummett and Hazlewood. Cover price $1.50. The 'Reign of the Supermen' continues from Adventures of Superman (1939) #502. The Last Son of Krypton squares off against the Man of Steel for the right to be Superman. 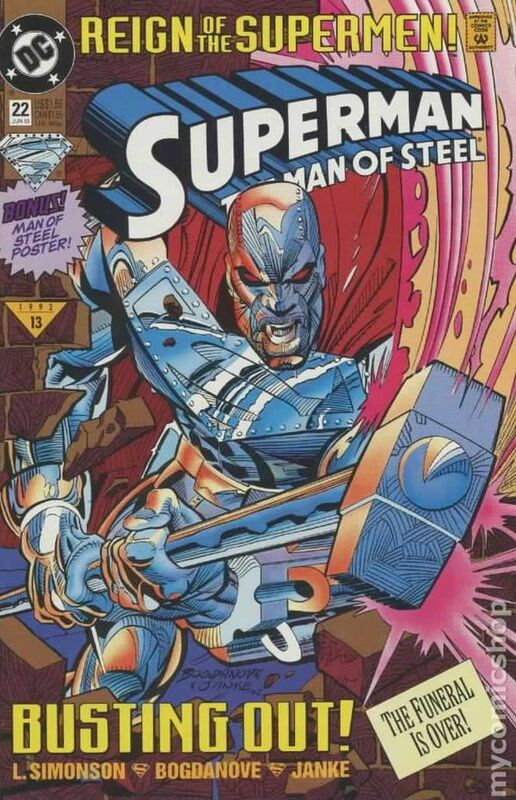 Continued in Superman The Man of Steel (1991) #24. All the Superman titles now use a new, upgraded color process that employs an increased color palette. Written by Roger Stern, with art by Jackson Guice and Denis Rodier. Cover by Ed Hannigan, Kerry Gammill and Guice. Cover price $1.50. Published Aug 1993 by DC. The 'Reign of the Supermen' continues from Action Comics (1938 DC) #689. The Man of Steel takes on the crimelord White Rabbit after confronting the cold, alien Superman (a.k.a. the Last Son of Krypton). 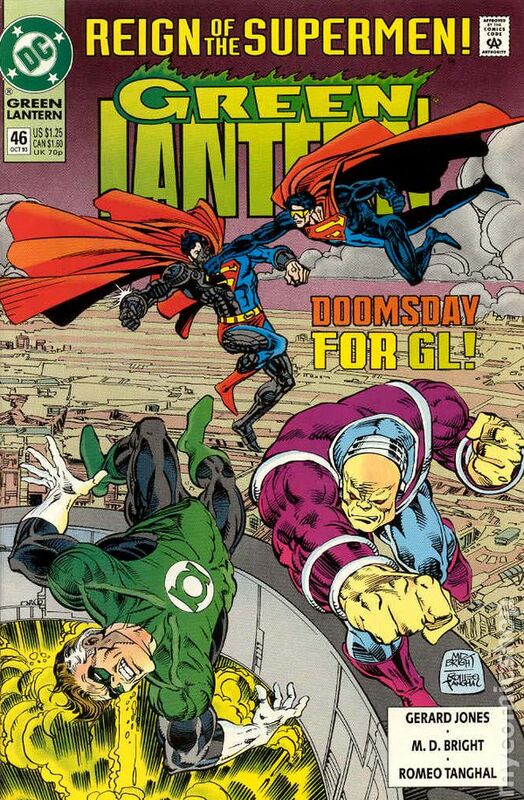 Also, Green Lantern's Coast City is threatened, as the menace of Mongul looms near! Continues in Superman (1987) #80. Written by Louise Simonson, with art and cover by Jon Bogdanove and Dennis Janke. Cover price $1.50. Reign of the Supermen! "Deadly Alliance!" Story by Dan Jurgens. Art by Dan Jurgens and Brett Breeding. 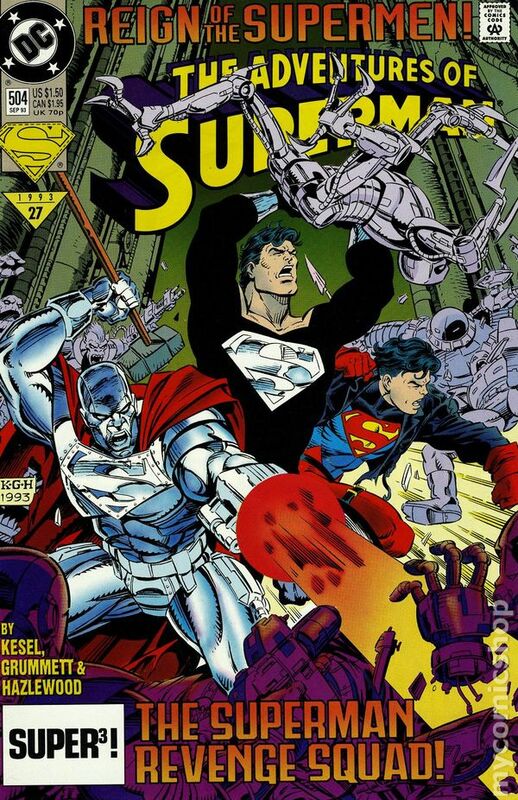 The Cyborg-Superman and the Kryptonian make war for the right to be the one true Superman, and Coast City is caught in the middle. Plus, Lex Luthor is beside himself. With his greatest enemy lying in his final resting place, the nefarious villain must now contend with four dopplegangers who all claim the mantle of Superman. Plus, a shocking final page you just can't miss. NOTE: This is a dark chapter in the history of the DC Universe. One that leads to the fall from grace of one hero (Hal Jordan). Destruction of Coast City (leads to Green Lantern's Emerald Twilight). Cover price $1.50. 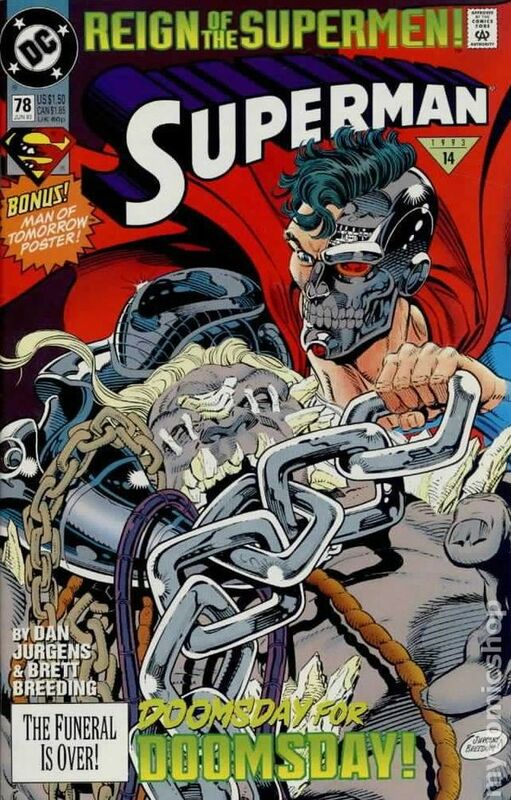 The 'Reign of the Supermen' continues from Superman (1987) #80: The cyborg Superman, determined to rid the world of all the 'pretenders,' captures the teenaged Superman and imprisons him outside of Metropolis. Also, Mongul begins building his 'Engine City' on the ruins of Coast City...and, down in Antarctica, something stirs in the Fortress of Solitude! Continued in Action Comics (1938 DC) #690. 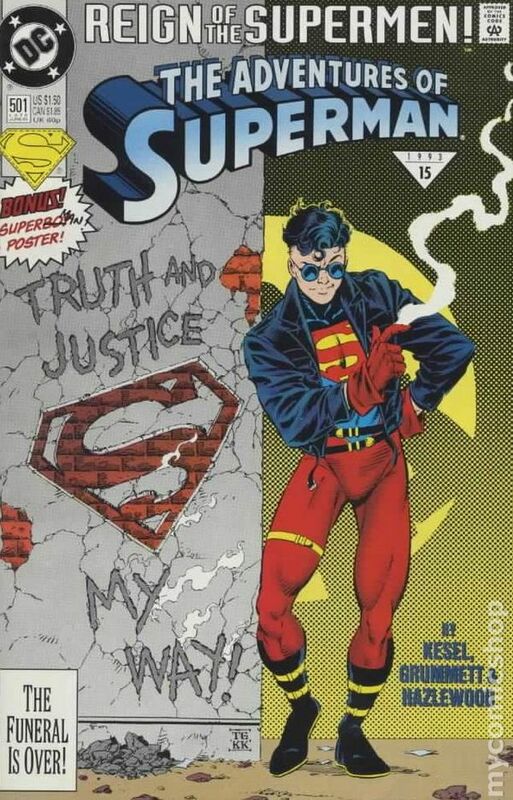 Written by Karl Kesel, with art by Tom Grummett and Doug Hazlewood. Cover by Grummett and Hazlewood. Cover price $1.50. The 'Reign of the Supermen' continues from Adventures of Superman (1939) #503. Earth has turned against Superman as the teenaged Boy of Steel learns that Metropolis may suffer the same explosive fate as Coast City. 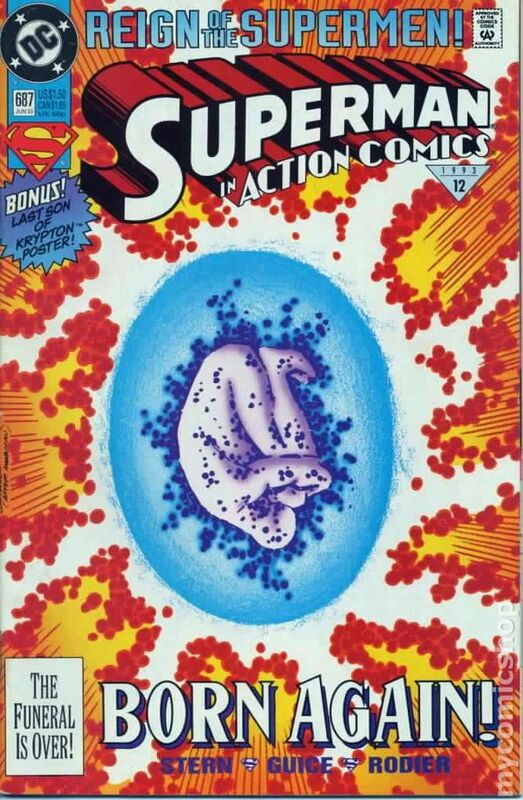 Continued in Superman The Man of Steel (1991) #25. Written by Roger Stern, with art by Jackson Guice and Denis Rodier. Cover by Kerry Gammill and Guice. Cover price $1.50. Published Sep 1993 by DC. Reign of the Supermen! The Man of Steel, Lois Lane, Superboy & Supergirl try to get to the bottom of the Cyborg & Mongul's plans in "The Return!" Written by Louise Simonson. Art & cover by Jon Bogdanove & Dennis Janke. Cover price $1.50. Reign of the Supermen! "Resurrections!" 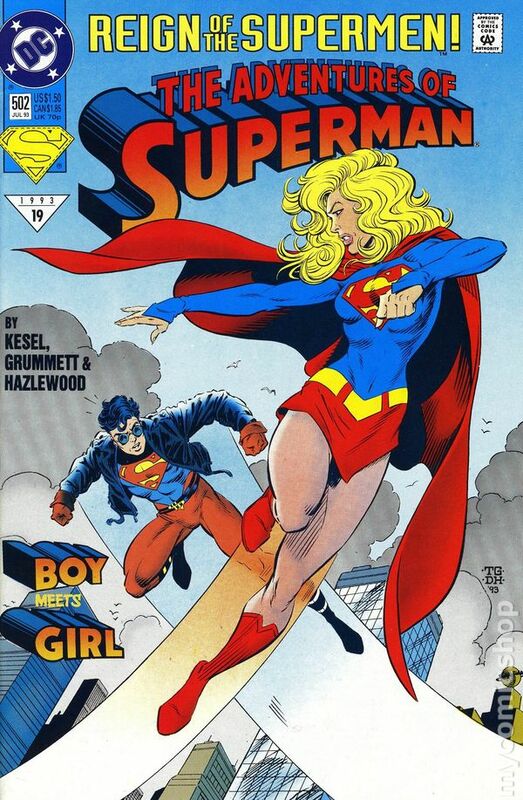 Guest-starring Supergirl, Superboy and Steel. Story by Dan Jurgens. Art by Dan Jurgens and Brett Breeding. The one true Man of Steel has returned! 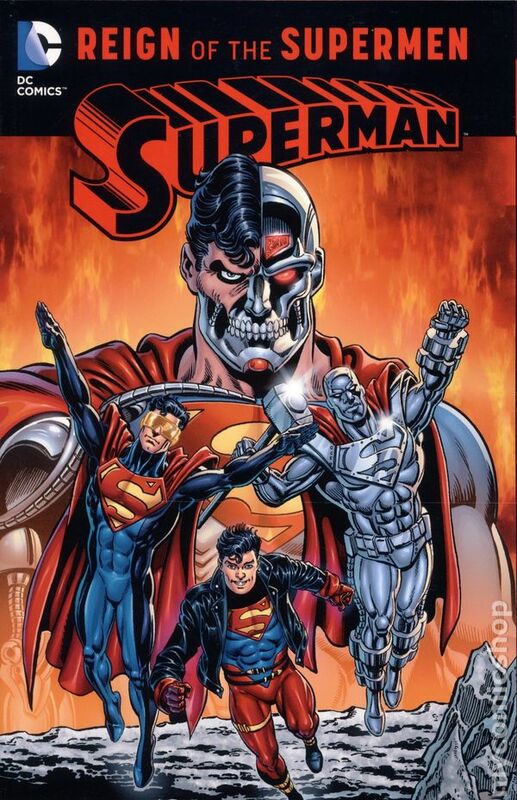 Now, Superman, along with the new Superboy and the man called Steel, must prepare themselves for the final battle with the treacherous Cyborg-Superman and his sinister accomplice, Mongul. Story continues in Adventures of Superman (1939-2006) #504. Cover price $1.50. The 'Reign of the Supermen' continues from Superman (1987) #81: Superman, Superboy and the Man of Steel storm Mongul's city despite the threatening levels of Kryptonite...levels so high that it could mean the end of Superboy! Continued in Action Comics (1938 DC) #691. Written by Karl Kesel, with art by Tom Grummett and Doug Hazlewood. Cover by Kesel, Grummett and Hazlewood. Cover price $1.50. The 'Reign of the Supermen' continues from Adventures of Superman (1939) #504. 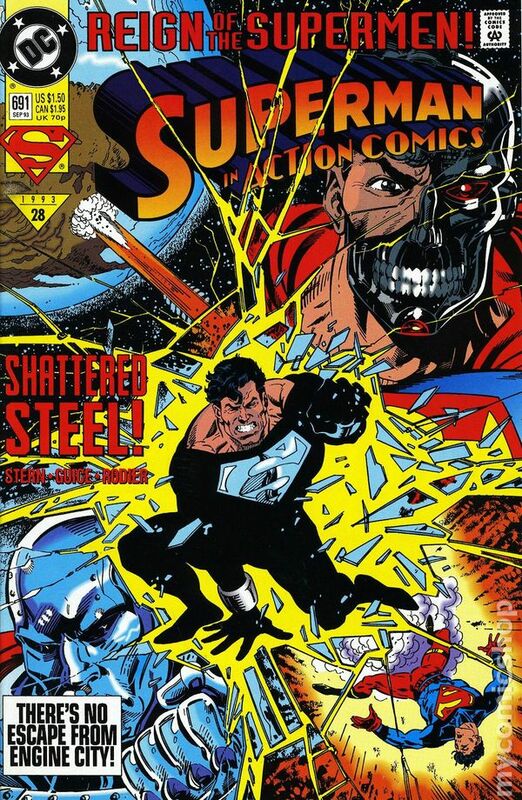 The Last Son of Krypton joins the fray at Mongul's 'Engine City'...and the fate of the Boy of Steel is revealed. 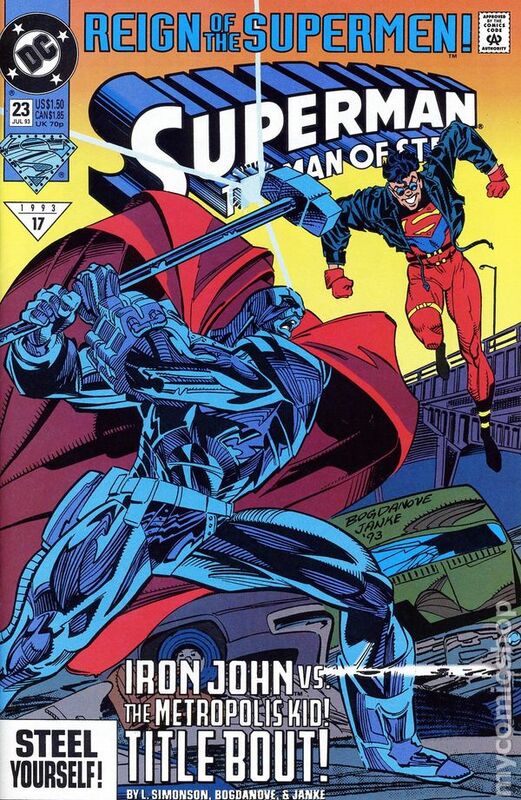 Continued in Superman The Man of Steel (1991) #26. Written by Roger Stern, with art by Jackson Guice and Denis Rodier. Cover by Kerry Gammill and Guice. Cover price $1.50. The 'Reign of the Supermen' continues from Action Comics (1938 DC) #691. It's do or die (again?) as the Men of Steel invade Mongul's Engine City! 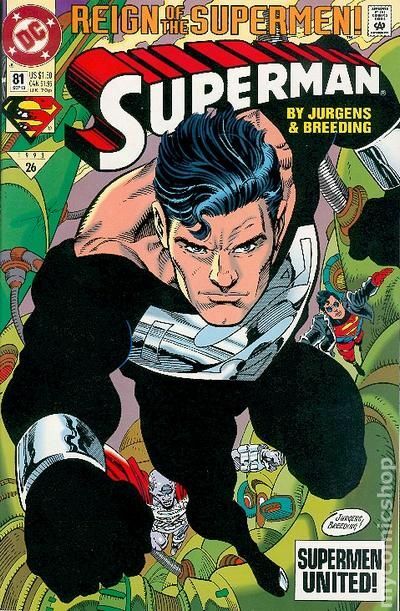 Continues in Green Lantern (1990 2nd Series) #46 and concludes in Superman (1987) #82. Written by Louise Simonson, with art and cover by Jon Bogdanove and Dennis Janke. Cover price $1.50. Reign of the Supermen tie-in. "Death City!" 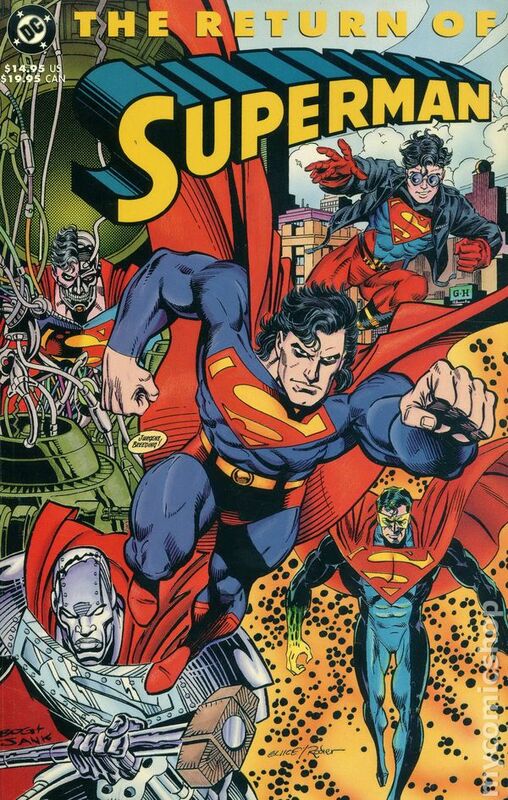 Guest-starring Superman, Superboy, Supergirl (Matrix), and Steel. Story by Gerard Jones. Art and cover by M.D. Bright and Romeo Tanghal. Hal returns from his ordeal in space to find Coast City destroyed. 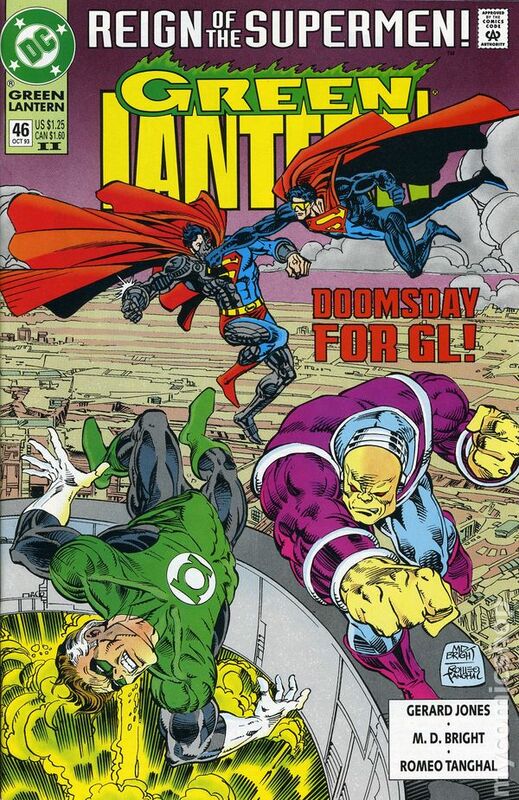 With everything he cared about gone, Green Lantern faces the culprits responsible - the sinister Cyborg Superman and the immensely powerful Mongul. Steel and Supergirl have already fallen, is Green Lantern next? Don't miss the tale that changes Hal Jordan's life forever! NOTE: This is the first printing and does not have a roman numeral II beside the issue number. Cover price $1.25. 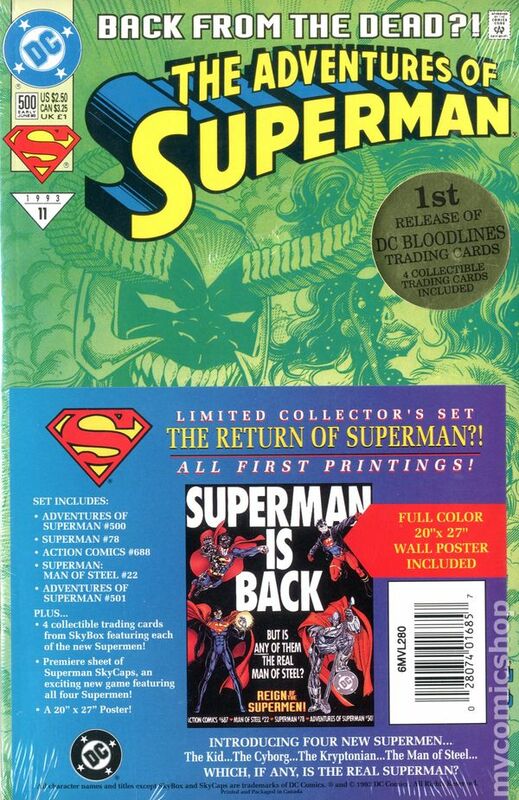 Polybagged edition with Superman poster - 1st printing. Reign of the Supermen! "Back for Good!" Guest-starring Green Lantern (Hal Jordan), Supergirl, Superboy, and Steel. Story by Dan Jurgens. Art by Dan Jurgens and Brett Breeding. Story continued from Superman: The Man of Steel #26. Has Superman returned from the grave only to be killed once more? Mongul and the Cyborg-Superman make their final move, and with Kryptonite all around, can even the Last Son of Krypton prevail? Get ready for the explosive finale to the Reign of the Supermen! Cover price $2.00. Signed by artist Brett Breeding with Lone Star Comics certificate of authenticity. Signed by artist Bret Breeding and editor Mike Carlin with Lone Star Comics certificate of authenticity. Collector's edition (chromium cover) - 1st printing. Reign of the Supermen! "Back for Good!" Guest-starring Green Lantern (Hal Jordan), Supergirl, Superboy, and Steel. Story by Dan Jurgens. Art by Dan Jurgens and Brett Breeding. Story continued from Superman: The Man of Steel #26. Has Superman returned from the grave only to be killed once more? Mongul and the Cyborg-Superman make their final move, and with Kryptonite all around, can even the Last Son of Krypton prevail? Get ready for the explosive finale to the Reign of the Supermen! Cover price $3.50. Newstand Edition - 1st printing. Reign of the Supermen! "Back for Good!" Guest-starring Green Lantern (Hal Jordan), Supergirl, Superboy, and Steel. Story by Dan Jurgens. Art by Dan Jurgens and Brett Breeding. Story continued from Superman: The Man of Steel #26. Has Superman returned from the grave only to be killed once more? Mongul and the Cyborg-Superman make their final move, and with Kryptonite all around, can even the Last Son of Krypton prevail? Get ready for the explosive finale to the Reign of the Supermen! Cover price $2.00. 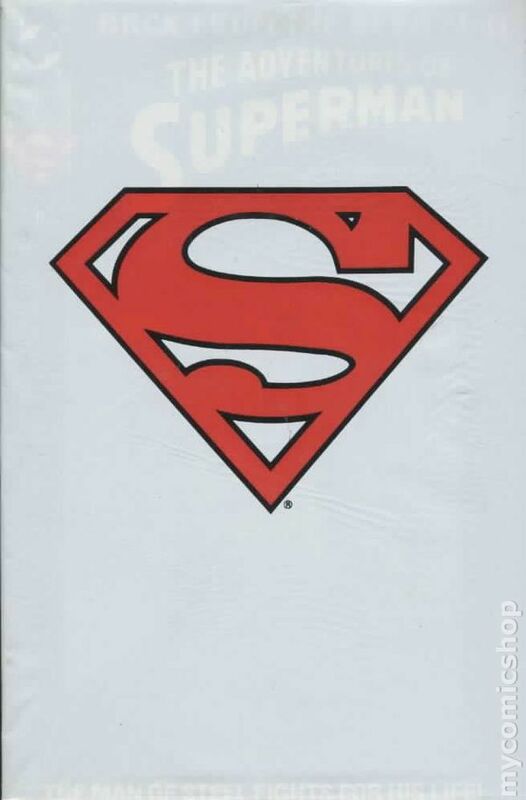 Reign of the Superman: Epilogue (Uncredited) - $1.50 cover-priced newsstand edition (does not have a "holografix cover) Cover price $1.50. Reign of the Superman: Epilogue (Uncredited) - The real Superman is back, and wastes no time in confronting Loophole and his gang as they hit a bank in "Reign of the Superman!" Written by Karl Kesel. Art & cover by Tom Grummett & Doug Hazlewood. Cover price $2.50. Published Dec 1993 by DC. 1st Edition - 1st printing. Collects Action Comics (1938-2011 DC) #687-691, Adventures of Superman (1939-2006) #500-505, Green Lantern (1990-2004 2nd Series) #46, Superman (1987-2011 2nd Series) #78-82, and Superman The Man of Steel (1991-2003) #22-26. Written by Dan Jurgens, Karl Kesel, Louise Simonson, Roger Stern. 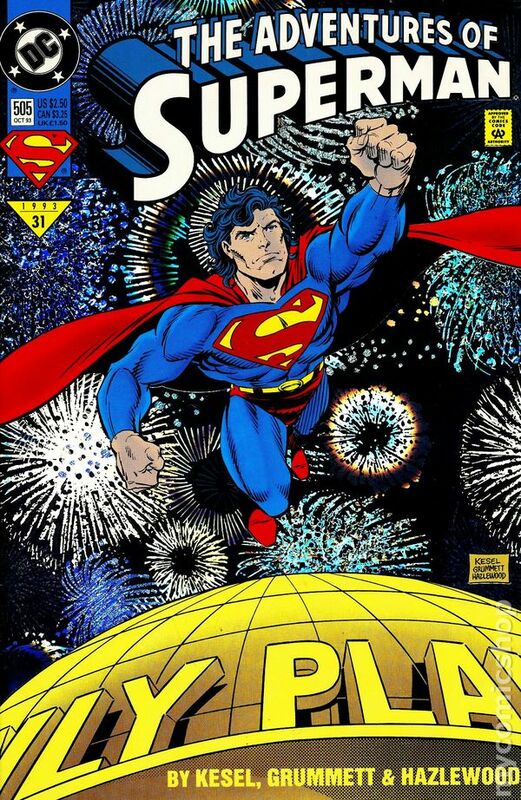 Art by Dan Jurgens, Jon Bogdanove, Tom Grummett, Jackson Guice, Brett Breeding, Doug Hazelwood, Gerold Jones, M.D. Bright, and Romeo Tanghal. Superman: The Return of Superman collects the "Reign of the Supermen" storyline in its entirity, plus a key moment in the life of Hal Jordan (Green Lantern). It's the tragedy that sets this hero down a dark path. Softcover, 480 pages, full color. 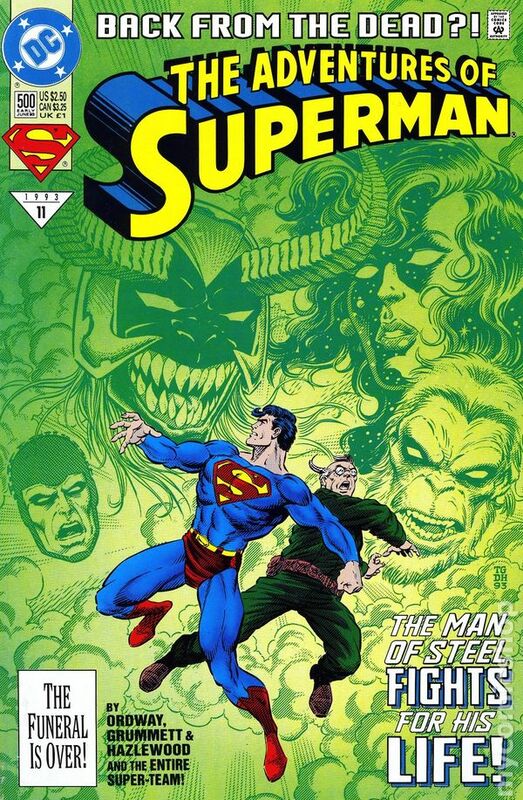 NOTE: See also Superman: The Death of Superman TPB (1993) and Superman: World Without A Superman TPB (1993) Cover price $14.95. Published Dec 2005 by DC. 1st Edition - 2nd and later printings. NOTE: Covers on reprints may vary. 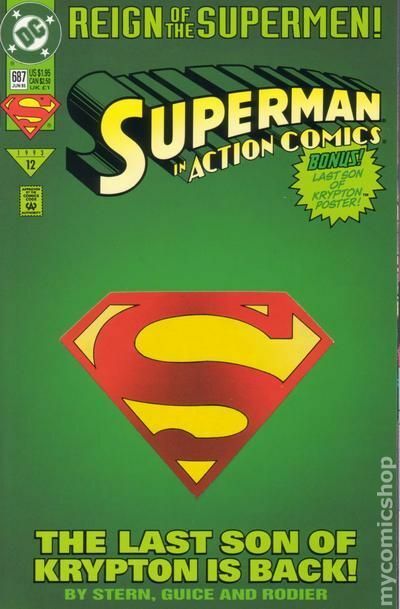 Collects Action Comics #687-691, Adventures of Superman (1939-2006) #500-505, Green Lantern (1990-2004 2nd Series) #46, Superman (1987-2011 2nd Series) #78-82, and Superman The Man of Steel (1991-2003) #22-26. Written by Dan Jurgens, Karl Kesel, Louise Simonson, Roger Stern. 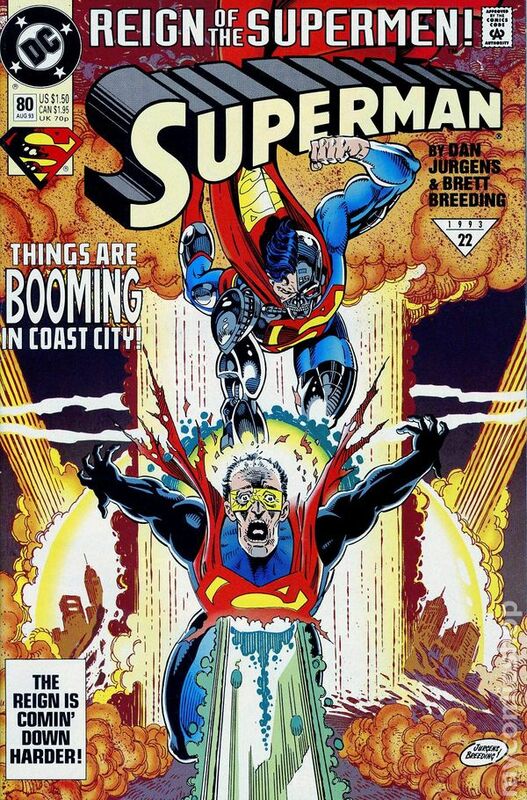 Art by Dan Jurgens, Jon Bogdanove, Tom Grummett, Jackson Guice, Brett Breeding, Doug Hazelwood, Gerold Jones, M.D. Bright, and Romeo Tanghal. 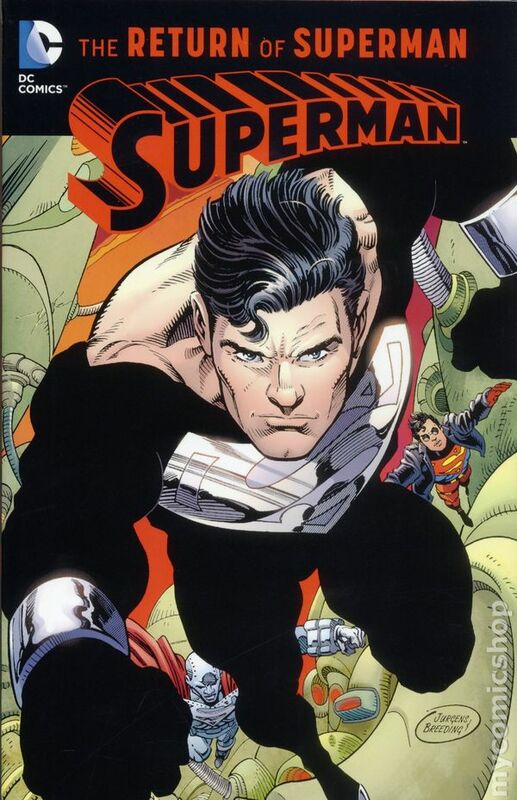 Superman: The Return of Superman collects the "Reign of the Supermen" storyline in its entirity, plus a key moment in the life of Hal Jordan (Green Lantern). It's the tragedy that sets this hero down a dark path. Softcover, 480 pages, full color. NOTE: See also Superman: The Death of Superman TPB (1993) and Superman: World Without A Superman TPB (1993) Cover price $19.99.